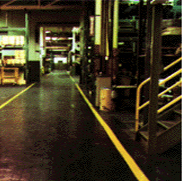 Jennison & Wright – Mfg Heavy Duty Industrial Flooring. IN STOCK FOR IMMEDIATE SHIPMENT, BUY DIRECT AND SAVE - Visa & MasterCard Purchasing Cards Accepted. Industrial flooring is virtually the "Foundation" upon which all industrial, manufacturing, commercial, distribution and storage plants are built. A variety of floor surfaces exist to meet specific challenges; heavy loads, ease of maintenance, resistance to chemicals and solvents, suppression of shock and noise transference, traction, safety, resilient and comfort. SERVING the following Industries; Automotive, Truck, Aircraft, Rail, Defense, Rubber, Printing, Foundry, Forging, Steel, Paper, Stamping, Aluminum, Energy, Dairy, Brewery, Bakery, Heavy Equipment, Machine Shop, Metal Fabricating, Glass, Wire & Cable. Jennison & Wright is a leading manufacturer and distributor of the above heavy duty industrial floors currently being used worldwide, assuring the end user the right flooring for the right application. Our specialty includes traditional End Grain Wood Block Flooring replacements that are not affected by moisture, humidity or water such as Jura Block Flooring, Rock Block Heavy Duty Industrial Floor Block, Stelwood Steel Tile Floor Plate embedded in fresh concrete and Hickory Pecan Laminated Press Pit Panel Flooring used over Stamping Press Pits and Trenches. Jennison & Wright is the largest industrial floor block manufacturer in North America. Because of this unique position in the industrial factory flooring industry, Jennison & Wright is in a position to assist owners, plant engineers, architects and contractors in designing, specifying and installing the correct flooring for each area of the plant under consideration. Jennison & Wright uses only materials which equal or exceed standard industry specifications. Ultimately, the customer receives less waste, less shrinkage, better appearance, and better performance. We ship from our IN STOCK inventory direct to you. Do not settle for second best!